Apple has also expanded the iPhone lineup with a new 64GB model on the high-end, selling for $399 with a service contract. The 32GB and 16GB models remain priced at $299 and $199, respectively. 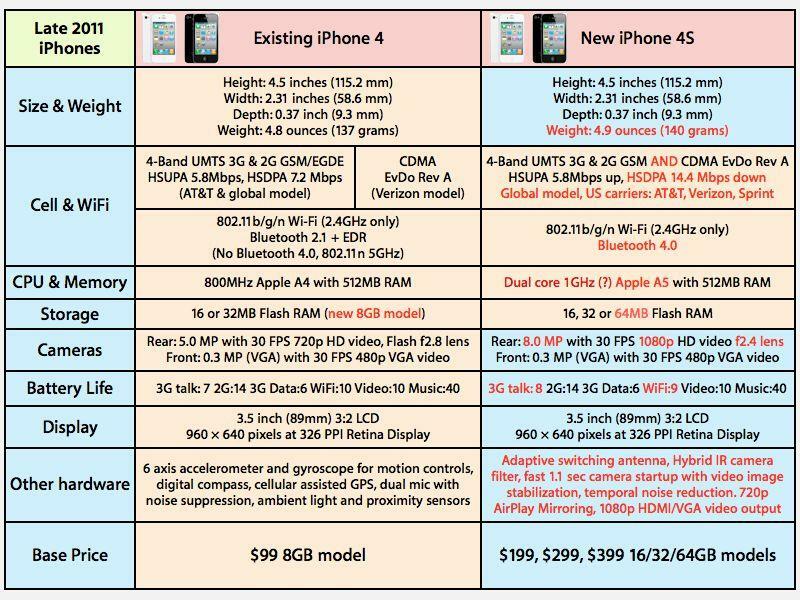 "iPhone 4S plus iOS 5 plus iCloud is a breakthrough combination that makes the iPhone 4S the best iPhone ever," said Philip Schiller, Apples senior vice president of Worldwide Product Marketing. "While our competitors try to imitate iPhone with a checklist of features, only iPhone can deliver these breakthrough innovations that work seamlessly together." One of the main selling points of the iPhone 4S is the inclusion of Siri, personal assistant software that Apple purchased last year. With Siri, natural language can be used to access information or accomplish tasks. In one example shown at Tuesday's keynote, the query "What's the weather like today?" led to a forecast being provided via the iPhone. The Siri functionality is built into iOS 5 on the new iPhone 4S. Apple said Siri is also smart about using the personal information users allow it to access. For example, telling Siri Remind me to call Mom when I get home it can find Mom in an address book, or ask Siri Whats the traffic like around here? and it can figure out where here is based on the current location. Siri helps make calls, send text messages or email, schedule meetings and reminders, make notes, search the Internet, find local businesses, get directions and more. Users can also get answers, find facts and even perform complex calculations just by asking. iPhone 4S includes an all new camera that Apple said is the most advanced optics of any phone. The 8 megapixel sensor has 60 percent more pixels so users can take amazing high quality photos with more detail than ever. iPhone 4S includes a new custom lens, a larger f/2.4 aperture and an advanced hybrid IR filter that produce sharper, brighter and more accurate images. 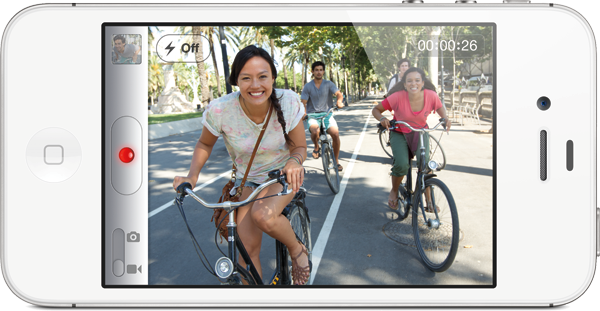 The Apple-designed image signal processor in the A5 dual-core chip is built for performance, and coupled with the features built into iOS 5, makes the camera one of the fastest on any phone. With iPhone 4S, Apple claims the Camera app launches much faster and the shot to shot capability is twice as fast. The new iPhone 4S will launch in the U.S., Canada, Australia, the U.K., France, Germany and Japan on Oct. 14. It will be the fastest iPhone roll-out Apple has ever had. The iPhone 4S has increased battery life up to 8 hours. A new wireless system in the iPhone 4S allows the handset to intelligently switch between two antennas to send and receive data, improving call quality. With its new system, Apple says the iPhone 4S achieves maximum theoretical download speeds of 14.4Mbps. Apple said these speeds are competitive with current 4G networks. The iPhone 4S also sports an 8-megapixel sensor for improved picture taking. A new illuminated sensor gets 73 percent more light than the one found in the iPhone 4, and does it a third faster. A high-end IR filter allows for greater accuracy and uniformity, while the handset also offers industry-leading quickness in snapping a photo. The new camera will also shoot full-high-definition 1080p video, and will feature real-time video image stabilization and temporal noise reduction. In one demo, Apple exec Scott Forstall asked the iPhone 4S to find a Greek restaurant in Palo Alto, Calif. The built-in Siri software returned a list of five restaurants sorted by rating. Siri can also read information to users. In one example, the software read a list of notifications from the iPhone 4S. The Siri system can also be utilized to make calendar appointments. It will even check if a user's schedule is free when setting up an appointment, and notify them of potential conflicts. Information from Wikipedia and Wolfram Alpha can also be accessed through voice commands in Siri. In another demonstration, Forstall asked Siri how long until Christmas. The "personal assistant" software responded: "82 days." Siri will come with built-in support for English, French and German. The software will be beta at launch, with more languages and services to be added over time. 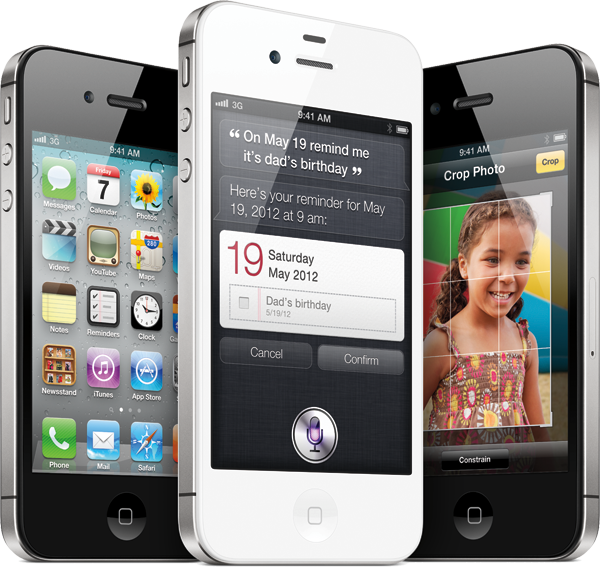 iPhone 4S comes in either black or white and will be available in the US for a suggested retail price of $199 (US) for the 16GB model and $299 (US) for the 32GB model and $399 (US) for the new 64GB model. iPhone 4S will be available from the Apple Online Store, Apples retail stores and through AT&T, Sprint, Verizon Wireless and select Apple Authorized Resellers. iPhone 4S will be available in the U.S., Australia, Canada, France, Germany, Japan and the UK on Friday, October 14 and customers can pre-order their iPhone 4S beginning Friday, October 7. iPhone 4 will also be available for just $99 (US) and iPhone 3GS will be available for free with a two year contract. 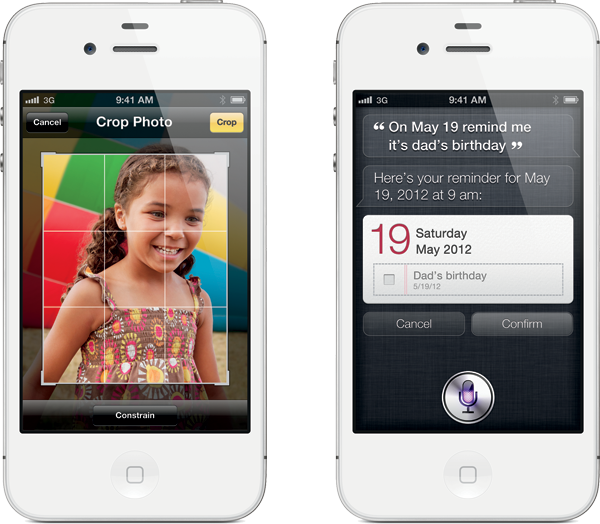 Siri will be available in beta on iPhone 4S in English (localized for US, UK and Australia), French and German. iOS 5 software will be available on October 12 as a free software update via iTunes 10.5 for iPhone, iPad and iPod touch customers. In late September, AppleInsider pegged the weekend of Oct. 14 for the release of the iPhone 4S, due to sources indicating that Apple had blacked out employee vacations during the second week of October. AppleInsider also recently discovered an Apple patent application pertaining to accelerometer- and gyro-facilitated video stabilization.